Les joined Burnley from his home town club of Liverpool in November 1949 for a fee of £6,000, and it all came about because he was selected to play for a Central League Select XI against Burnley, who had won the league, in a game at Turf Moor a month earlier. He was struggling to make an impact at Liverpool but his performance that day was enough to persuade manager Frank Hill that he was good enough to join the fast improving Burnley side. He made his debut just over a month after signing, coming in at outside-right for the injured Jackie Chew and it was in this position that he played all of his eight games that season. One of those was a 1-0 win against Huddersfield at home when he scored the only goal, his first for us. 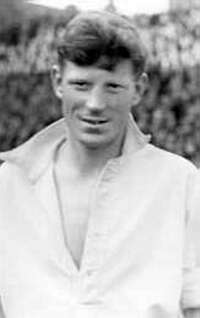 If he’d made a good start at his new club he had something of a wait before he could establish himself in the first team and he didn’t make a single appearance in the 1950/51 season, but the following season his fortunes were to change when he first stepped in to replace the injured Jimmy McIlroy at inside-left. When Jimmy returned to the side he took the right hand side position previously held by Billy Morris with Shannon establishing himself in the number 10 shirt. This was the season when two FA Cup ties linked Les Shannon and myself, and the second of them was to put me into contact with him just about a year ago. In the 3rd round that season we were drawn at home to the then named Hartlepools United and it was a day of drama in our household that almost forced my dad to miss the game. I suppose I was always meant to be a football fan because I was born on this particular day, FA Cup 3rd round day, one of the big days in the football calendar. Knowing my dad, I’m sure he was panicking as I delayed my arrival but thankfully I turned up just in time for him to get down to the Turf where it was Les Shannon who put the icing on the cake for us by scoring the only goal of the game to take us through to the next round. Having beaten Coventry in the next round, we were then drawn against Liverpool and in another win, this time 2-0, Les scored again against his former club. This particular goal was shown on television prior to our tie against Liverpool last season and this led to me receiving an email from his niece Caroline and finally contact with the player who gave me a winning start in life. As Burnley continued to progress during the 1950s Les established himself as a first team regular, for three seasons at inside-left and then, following the retirement of Reg Attwell, at left-half. I was never fortunate enough to have seen him play but I’ve asked a number of supporters about him and they all come back to me with glowing reports of him. 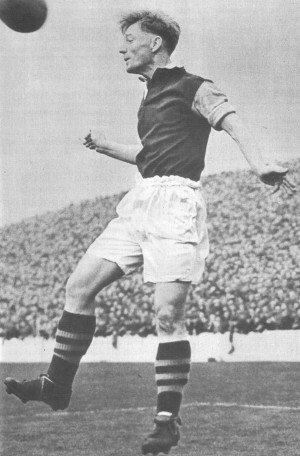 He went on to play 281 games for Burnley, scoring 44 goals, but in September 1958 he played his last game at the age of 32, a 2-2 home draw against Luton, a club he was to be involved with some years later. He captained the reserves before moving to Everton as a coach in 1959 and he eventually went on to manage both Bury and Blackpool, steering the Seasiders back into the top division in 1970. After leaving Blackpool he spread his wings and coached at a number of clubs in Greece before returning home where he finally hung up his football boots as a scout with Luton Town. Such was his knowledge of the game that Channel 4 turned to him when they produced the football programme ‘The Manageress’ in the late 1980s starring Cherie Lunghi. She played the part of the first ever woman football manager and Les was the football advisor on the programme. It’s fair to say he had a long and successful career in the game, that included England ‘B’ caps and an appearance for the Football League. And he certainly played a big part in moving the Clarets towards that 1960 Championship even though he did just miss it himself as his playing career came to an end. I don’t know which of his 44 Burnley goals he’ll consider his best but I know which one I’ll always remember the most – Les Shannon, my favourite Claret I never saw play. It was an honour to get in contact with him a year ago and the letter I received I will always treasure. Have a great 80th birthday Les.